…BeautyUK to be precise. Voodoo – No. 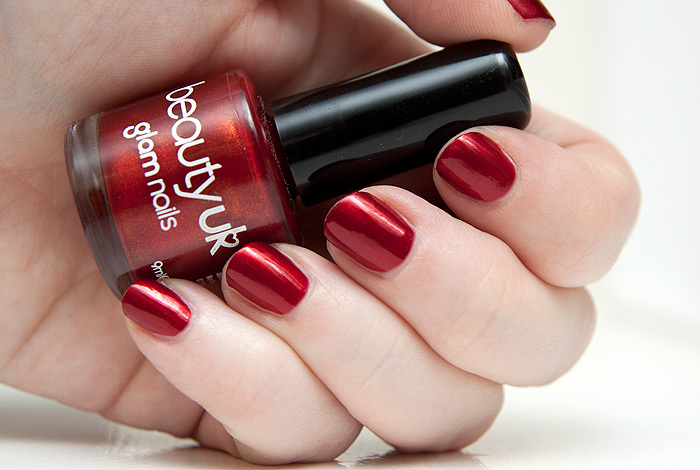 55 (£1.99) is an absolute cracking shade for Autumn, a deep russet with a playful shimmer that glows in the right light. Two coats to achieve opacity, I did get a tiny bit of bubbling on one nail which made me a little more careful with the application than I might normally be. Now we’re talking! I see toffee apples, fallen leaves, crisp afternoons and misty mornings. Brrr… c’mon Autumn, I’m ready for you! Are you ready for Autumn? Digging out your vampier shades yet? Gorgeous Autumn mani! I always feel sad that our Superdrug sells BeautyUK and not MUA, but this might change my mind. Sorry if I am being a bit thick, but where do you get your Inglot polish from? I can’t find an online stockist. Ooooh, that’s quite nice, innit? I quite like the Beauty UK polishes you know. Any polish that makes me see toffee apples is a winner, it’s been years since I had one. Golden fall leaves. Absolutely love this. Do you remember how much the Inglot polish costs? I see fallen Autumn leaves! The red is such a pretty colour! For anyone looking for an alternative to the Inglot polish, GOSH do one called ‘Rainbow’ which is basically the same thing. I’m DEFINITELY Autumn ready! Love the deep, dark, dramatic shades. OOOhhhh!!! That’s so pretty! I went past Superdrug and managed to resist the temptation to go in, but now that I’ve seen this I’ll have to go back very soon! 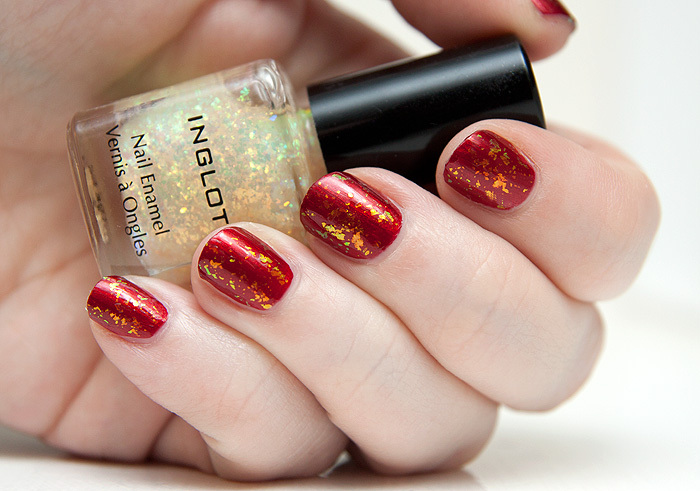 I like the red colour by itself, but love it with the inglot top coat. Thats such a good luck ! Ooh pretty, been wearing Autumnal nails for a while now. Cracked out the purples, teals and currently have No.7 Beautiful Black on my fingers and toes! Wow I love it, it reminds me of christmas! It's National Kissing Day... C'mere gorgeous!